The project team have secured follow-on funding to produce bespoke guidance on including ecological enhancements in the planning, design and construction of rock and concrete coastal structures. These guidance documents are the first known globally. They have been made for the Environment Agency and for Portland Port and Harbour Authority, focussing more specifically on the ports and harbours community. We have delivered numerous talks and held meetings with various end user communities including the general public, engineers, coastal managers, concrete manufacturers, quarries, harbour masters and environmental consultancies. The number and range of people we’ve interacted with has grown steadily through the project. A few examples are showcased here. 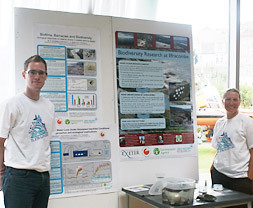 Results from work carried out as part of a larger project examining the interactions between coastal defences and the organisms that colonise them was presented at the 9th Institution of Civil Engineers International Breakwaters Conference in Edinburgh. www.ice-breakwaters.com. This major event had more than 400 attendees, and featured over 100 presentations across a range of coastal defence issues. Martin Coombes (University of Exeter) presented work looking at the response of micro-organisms and barnacles to different materials used in defence construction, and the opportunities for manipulating small-scale texture for meeting the requirements of ‘good ecological potential’ set out in the European Water Framework Directive. The work presented is being published as a paper in the conference proceedings in collaboration with Larissa Naylor (University of Exeter), Stephen Roast (Environment Agency) and Richard Thompson (University of Plymouth). One strand of this project involves working with The Ilfracombe Harbour Office to look at the longer-term relationships between biota and hard rock structures. Through this collaboration, we were asked to participate in the Inaugural Sea Ilfracombe Festival in September 2009. Larissa Naylor, Martin Coombes and Alejandra Feal-Pérez provided an interactive display to the general public and interested stakeholders. Our display was well-attended, with lots of questions asked by youngsters, interested enthusiasts and professionals alike. 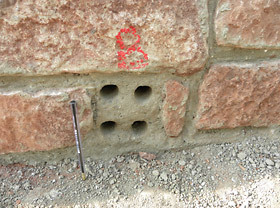 Joint DEFRA-EA Manual on concrete in maritime Engineering - March 2009. The manual on the use of concrete in maritime engineering was revised and published in 2010. We influenced the draft revised manual, by signposting the potentially important interactions between concrete and ecology. This excerpt is included in the revised manual: "Research being undertaken by Exeter and Plymouth Universities (due for completion in 2010 and funded by the EA and Great Western Research) is using a combination of field trials, surveys and laboratory-based analyses to examine how colonisation of structures in the inter-tidal zone is influenced by the physical properties of the materials they are built out of. The research will promote understanding of how new coastal defences can be designed to maximise their long term biodiversity potential through initial material choice, and how these materials can be manipulated through construction to promote valuable ecology. Coombes, M.A., Naylor, L.A., Jackson, J., Thompson. R.C., (2012). Shaldon and Ringmore Tidal Defence Scheme: Ecological Enhancement Monitoring Report (18 months post-construction). Report to the Environment Agency by the University of Exeter and University of Plymouth. 20pp. Naylor, L.A., Venn, O., Coombes, M.A., Jackson, J. Thompson, R.C. (2011): Including Ecological Enhancements in the Planning, Design and Construction of Hard Coastal Structures: A process guide. University of Exeter report for the Environment Agency. 66 pp. Naylor, L.A., Coombes, M.A., Venn, O. (2011): Considering Ecological Enhancements in Hard Coastal Infrastructure: Initial Guidance for Ports and Harbours. University of Exeter report for Portland Port Authority. Naylor, L.A., Coombes, M.A., Baldock, L., White, A. (2011): Portland Port Rapid Appraisal: of the physical habitat characteristics and biotopes found on selected hard structures at Portland Port. University of Exeter report for Portland Harbour Authority. Researchers from the University of Exeter and University of Plymouth working with the Environment Agency to develop options for environmental enhancement of a major new tidal defence scheme. Interserve began construction in March 2010 on the £8.4 million, Environment Agency funded, Shaldon and Ringmore Tidal Defence Scheme in the Teign Estuary, Devon. The Environment Agency and Atkins (the scheme’s engineering contractors) contacted us to explore ways incorporating enhancement opportunities for biodiversity to fulfill requirements for habitat enhancement as part of the environmental impact assessment process. Orlando Venn (Environment Agency) and Tim O’Shea (Akins Global) enlisted the help of Larissa Naylor, Richard Thompson, and Martin Coombes to develop possible enhancements for the scheme. These are being incorporated into the build phase along with a monitoring programme to examine the outcomes of these measures. This operational trial will serve as a ‘good practice’ case study which can be used in future sustainable design guidance for maritime structures. Please contact us if you would like advice on the design and testing of habitat enhancement for other coastal defence structures.